As you start working with Quicken 2012, you probably want to work from the Spending tab. Basically, it looks and works (sort of) like a web page that provides clickable hyperlinks to some of the most popular banking and bookkeeping features of Quicken and supplies interesting tidbits of financial trivia. But initially, before you start entering data, the tab looks pretty sparse. To enter checkbook transactions, look for the bank account you want to work with listed in the Accounts bar. When you see the bank account, you can click it to display that account’s transactions in a register. 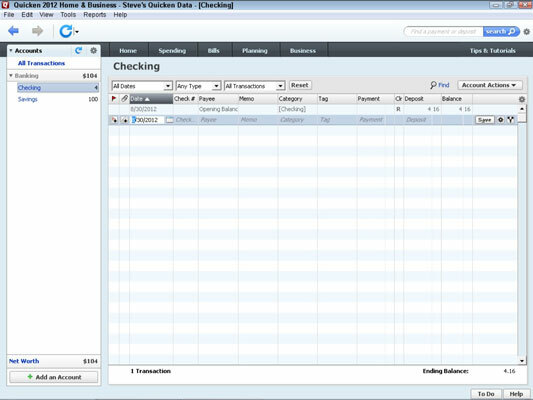 The account name — Checking — is highlighted in the Accounts bar and in the Quicken program window title bar. 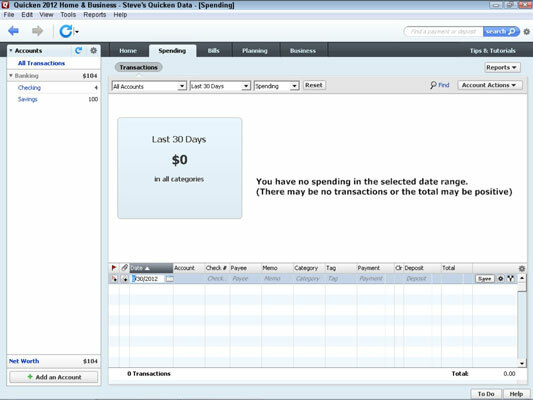 The starting balance you specified as part of setting up the account is the first amount that Quicken lists. For example, in this figure, the starting balance is $4.16. Bummer. First things first: You can enter checks by using the Spending tab and its register window or the Write And Print Checks window.